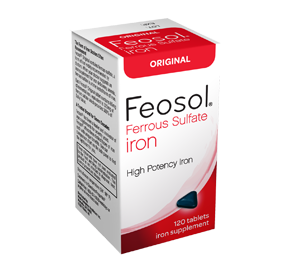 Feosol® Original contains ferrous sulfate, a form of iron widely recommended by doctors. In fact, for decades it was the most doctor-recommended form of iron. A Classic Iron. A Great Value. When your doctor suggests an iron supplement for iron deficiency anemia or low iron, ferrous sulfate is a safe and time tested form of iron. Each Feosol® Original tablet contains 65 mg of elemental iron, equivalent to 325 mg of ferrous sulfate, which provides 360% of Daily Value, making it a high potency iron supplement. Feosol® has been a leader and innovator of iron supplements for seventy years. Feosol® offers three distinct types of iron each with unique benefits. Lactose, sorbitol, crospovidone, magnesium stearate, carnauba wax. Contains 2% or less of FD&C blue #1, FD&C yellow #6, hypromellose, polydextrose, polyethylene glycol, titanium dioxide, triacetin. One tablet daily or as directed by a physician. Children under 12 years old should consult a physician. Do not exceed recommended dosage. Iron may interfere with absorption of certain antibiotics; these products should not be taken within two hours of each other. Occasional gastrointestinal discomfort (such as nausea) may be minimized by taking iron with meals. If pregnant or nursing, consult a physician before using this product.